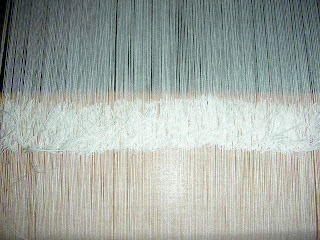 This is the joining of the old and new warp. Rachel said a little crab like machine does the work. I just love all the little knots. My fabric sample (Friday) this took about Halp an hour to weave, with the help of Cybil winding bobbins for me. Well its been a while since Mel or I have posted anything on this blog, we are slack I know but with exhibtions, study,work etc we are both busy people. I spent a wonderful week in Melbourne at RMIT University 2 weeks ago. Helen Houston from Scotweave (Scotland) taught a class on Scotweave software as an introduction to the program for industry and interested artists. What a great week. There were 9 participantes including 3 RMIT staff ( opps having problems with cat who likes to walk and sleep on key board) the week gave me a chance to try a new program (always a challange). The program is easy if I may say that any computer program is easy to use. 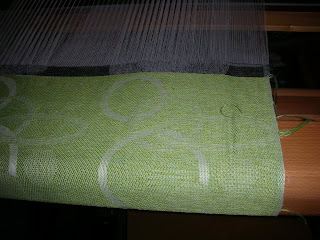 After a week I felt that I could scan or draw an image and work it in Scotweave and weave it. Although there is so much for me to learn I think I can cope with the basics'. Although I am sure I will need to do pleanty of refreshing with the software before I could start again. in the future. During the week we learnt to design yarns on the program, this makes it easier to view your design as a simulated image thats would look more like your finished work. 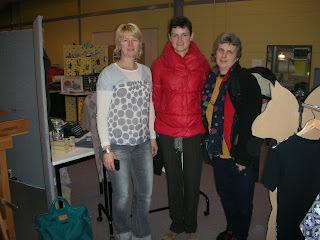 Next was dobby weave and then artwork and finally jacquard just what we had all been waiting for. I must say I became a bit of a circle/spot girl. They were easy to draw and quick to get a result. I need to do more work with double cloth to understand the full benefits of the program I think. 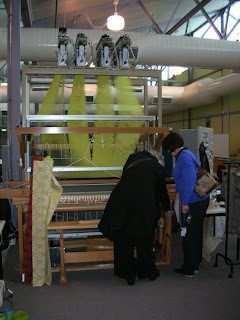 It was interesting to see all the equipment that RMIT has, so many wonderful hand looms and industrial looms I have never seen. I find the complete loom of interest. All the threads and working parts of a loom so of course I took photos of these as well. Over the next few days I will write some more about the trip and add more photos'. I am now hoping to get back to Melbourne to play again. I have a few ideas for exhibition work but will need to plan, work in photoshop, plan, plan save some money, plan, hope Pat lets me come to Melbourne and I will be away!